Obviously I mainly write about what I like here, but I try to make this site representative of what is out there, without going off too many times on trends that I dislike or getting too worked up over some hippy hoppy dreck plaguing the airwaves. I have missed most of the Afro-funk revival after getting the flavour of it with the first few Soundways releases, but now every other African release seems to be a Fela-era compilation of obscure grooves from the sweaty James Brown-inspired depths of Lagos. From the cover, Nigeria 70 looks like a reissue. Some collectors looks for the unknown; I trust in the known. When I saw friendly and familiar stuff on here: "Eddie Quansah" by the Peacocks, Victor Uwaifo's "Ekassa no 1" and Rex Williams, I decided to buy it. Furthermore it was only half the price of the European imports that I keep finding and passing on. Face it, there's not a lot you HAVE to have. I have plenty of music and often just put on an old familiar CD or LP and play it a few times with no thought of what I may be missing out on in the new and exciting "in" tray. My own Nigerian LP collection took a big hit last fall when I was raising money to go back to India. I listed a lot of albums on EBay (including over a dozen by Chief Stephen Osita Osadebe which I burned to CD) and some sold for $100 or more. I made $2000 quite easily, but then I got greedy and listed some of my rarer albums, including the Peacocks album featured here. My timing was bad, or the moon was out of phase, so I ended up taking a bawth on the second round and having to part with some really cool discs for peanuts. Lesson learned. Hard-core Afrobeat collectors probably have most of this, but there's one or two nuggets you undoubtedly missed. I enjoyed it immensely. It starts with the opening riff of "I shot the sheriff" then slides into the familiar Afrobeat groove of Sir Shina Peters. (Her Majesty seems to bestow a lot of honorifics on Nigerians!) Reggae vibes return on Chief Checker's "Irie Africa," an irresistible groover, but it's mostly Afrobeat. This is another compilation by Duncan Brooker and features liner notes by John Collins, so you know it's top notch. The key to Afrobeat is a rolling sustained groove with repeated themes and a chugging groove. I thought Fela was more interesting in theory and on record than in person. I found his concerts insufferable but still enjoyed his music, especially when other musicians were soloing. There's been a glut of Fela material reissued since his death and now in fact a lot of it is turning up used from folks who overdosed on it. Nevertheless Afrobeat does have a place in the canon of modern pop music. For a wide array of approaches, you could do worse than check out this album that is a testament to the dedication of one dogged vinyl junkie. Duncan Brooker had a cushy job as a driver in East Africa and spent all his spare time combing little dukas looking for vinyl. What he found was dusty, warped, or played to death, but he persisted. He also found some of the musicians whose records he was doggedly pursuing, but that's the long story (Search The Guardian archives if you want to read it!). As a young Brit keen on rock and roll, funk and soul, he was particularly drawn to the era of African pop where the Big Crossover occurs, when Africans began listening to James Brown, War, and Tower of Power and copping it in their own inimitable way. This remarkable compilation features 11 such tracks and not only are they all gems, they are all totally unknown. The only artist you may have heard of is Frimpong, a pioneer of the Nigerian Afrobeat sound with his fine band the Cubano Fiestas making their debut in 1976. You certainly haven't heard of Dackin Dackino because his 12-minute Zairois jam, "Yuda" was never released. This Kona compilation is a heartening testament to persistence and vision. The sound is good overall, with one or two drop-outs and some scratchy vocals that may be from the original recording (The Orchestre Lissanga track is from a cassette release and is sonically the weakest but musically a scorcher). I look forward to volume two and salute the dedication of Mr Brooker and his label. Afrobeat has been gaining ground of late. Old-timers who prefer James Brown to more frenetic hip-hop are discovering that there's another side to the story of funk and that's the Nigerian variety which is sung in pidgin English (mostly) and includes grooves to rival Average White Band, War and other stalwarts of the US funk scene. James Brown himself checked out Fela's and O.J. Ekemodé's bands in Nigeria when Tony Allen was with them and that may have inspired his "Funky Drummer," a nine-minute Famous Flames classic. (Typically Fela was paranoid that the Famous Flames had come to secretly tape-record his show and steal his sound. What ego! O.J., on the other hand, wrote a song welcoming JB to Nigeria.) While the back-catalogue of Fela has been revamped, there have been other developments in the USA including a new release TALKATIF from Brooklyn-based ANTIBALAS, a 15-piece big band that knows how to churn the funk. Like Fela they have a political message, but they know when to shut up and boogie. They do sound a lot like a less-preachy Fela tribute band with identical instrumentation -- shekere, Hammond B3, wah-wah guitar, punchy horn choruses, baritone sax and bass -- it's a sound to make you get down. There are at least four volumes of Oliver de Coque "Hits" on the market; I know because I saw mention of his "Hits Volume Four" on a website, but so far I have only located this one which came out in 2000. Nine tracks are listed but only 8 seem to be on here, and one is a dud! However that leaves 7 scorchers for your delectation. There's even liner notes -- what a treat! So we learn that Oliver de Cocque's real name is Sunday Akanite, and he was born in Ezenifite, Anambra State in 1947. He started playing Ekpili, an Igbo folk music, with the Ukomu Club after qualifying as a stenographer in 1965. After the civil war he joined Sunny Agaga's Lucky Star Band (a juju group) playing lead guitar. Subsequently he was in Jacob Oluwole's Friendly Unity Juju Band and Sule Sgboola's Moonlight Guitar Band before releasing his solo debut, FIRE DISASTER in 1976. This song chronicles the tragic fire that destroyed the Aba Traders' market and became an instant hit, particularly with Igbo-speaking highlife fans. With fame came fortune and a string of hits with his band the Expo 76 Ogene Sound Super of Africa. Ndubuisi Nwachukwu completes his liner notes with this well-turned paragraph: "Oliver who styles his kind of highlife Ogene has represented the country in sundry international fora including the 1st Los Angeles Music Festival in the United States. With as many as twenty international awards and honor in his kitty, this guitar twanging son of an Igbo native singer ably supported by his herbalist/soothsayer mother is in vanguard of those still keeping the highlife inferno aglow in Nigeria." None of his four hits mentioned in the liner notes is on this album, but the tracks here are great long jams with guitar and talking drum and plenty of good feeling to get you grooving. From IndigeDisc comes a great rarity: Haruna Ishola and his Apala Group's APALA MESSENGER. The 13 tracks here were recorded from 1967 to the early '70s. The groove is there, sustained and relentless, though the early recordings were shorter due to the technology. The instrumentation is traditional Nigerian: talking drums, calabashes, cowbells and a barely audible bass thumb piano instead of guitar. In fact there are no Western instruments in the line-up, though inevitably there's an Afro-Cuban tinge. The call and-response vocals are familiar from other Muslim music. Apala eventually gave way to Fuji music, but fans of any Nigerian music will want to bask in the propulsive groove of the talking drum and sweet vocals of these messengers of Apala. It's an odd phenomenon of CDs that you sometimes end up getting albums over again. Not that they are remastered or remixed, just resequenced or repackaged in a way that makes you hear them differently. On the downside are the screw-ups of the SONO 365 CD series: duplicated material, tracks at the wrong speed, albums split up and lumped with material from different periods. On the upside is something along the lines of the compilation HIGHLIFE "High Ups: La Musique du Gold Coast des Annees 60," a 2-CD set from the French Night & Day label that licensed tracks from John Storm Roberts' Original Music label. Roberts is a Brit living in the USA who discovered African music in his youth, working, I believe, for the BBC in East Africa. His modest label, based in upstate New York, put out 40 compilations of classic African music, largely from the '60s and '70s, taken from rare 78s. Original Music seems to have gone out of business about 5 years ago, and I hear Roberts is working with the Smithsonian Institution on their music projects. He has a knack for finding great obscure stuff. Sure we knew the Ramblers did a killer "Knock on Wood," but who could have imagined their version of the rocksteady gem "Ride your donkey"? Or what about Charlotte Dada's "Don't let me down," which takes a Beatles riff and transforms it into a compelling mating ritual with insistent metal percussion?! They were two of the highlights of "Money No Be Sand" which drew parallels between Highlife and rock, calypso, James Brown's influence, etc. The French double-CD set is labeled "Highlife Ballades" and "Highlife Speed" which arbitrarily divides up the tracks, giving us 24 on each CD. Even if you have the Original Music albums you'll need this collection for the sequencing to play at your parties. For want of a better term, I have to say it's the Essential Guide to Highlife music. I wont bother listing the artists who range from the famous to the obscure, because all of the music is consistently great. However, the liner notes are slapdash and badly edited, which is unfortunate given the effort expended on the package. (One parenthetical note left in the text says, in French, "quote to be verified.") There are no notes on the tracks unless you resort to the old Original Music liners, which were informative if poorly designed. The appeal of Night & Day's presentation however is that those Original Music CDs are no longer in print and despite the shortcomings of the package, the music should not be missed by anyone wanting an introduction to the Golden Era on the Gold Coast. 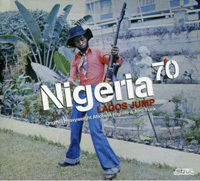 NIGERIA 70 lives up to its subtitle: "The definitive Story of 1970s Funky Lagos". The book (which requires magnification to read being in 5-&-a-half point type, in brown -- and that's the LARGE print) and the twin music CDs present a radiant picture of that intriguing branch of funk that flourished in West Africa in parallel to the North American development. Hypnotic rhythms, churning grooves, acid-edge, fuzz-tone guitar, Isley Brothers raves, and a swirling giddiness that makes you wanna boogie down. And here's something I had never heard before in African music: a take-off on Cream, heard in Blo's "Mother Earth," clearly a tribute to the live sound of Clapton, Bruce and Baker. Not surprisingly the liner note tells us the band consisted of former members of Salt, a band formed in Ghana by Joni Haastrup -- and Ginger Baker! The artist most identified with Lagos Funk, Fela Kuti is represented by a classic instrumental "Chop & Quench" propelled by his funky clavinet on the first album and a sax track, "Upside Down" on the second volume with a female vocal lead. Fela's music has the least to do with traditional African sounds, although his drummer Tony Allen pioneered a unique style of rhythm that is the underpinning of Fela's style. Also present here is an ultra-rare cut "Olufe Mi" by Koola Lobitos (the Cool Cats) which was the earliest incarnation of Fela's band, predating his stay in California in 1969 where he absorbed American funk influences. It's astounding to hear parallels to rock, Motown, soul and jazz and then witness the sound veer off into the bush as the Yoruba elements come to the fore with the talking drum. There is also a bonus CD which is a documentary program with poetry, commentary and snippets of music that sounds intriguing. I'm saving it for a rainy day. This is a thoughtful and intriguing compilation and charts a fresh course through familiar terrain, presenting it with flair and originality. With a champagne libation dedicated to the ancestors, Baba Ken Okulolo opened the Nigerian Brothers show at Ashkenaz. He slapped a clay jug while he sang and the packed house was back in the village. The room temperature was hot enough and the vibes were benign enough to transport several hundred Berkeley hippies to the Yoruba bush for a transcendent set of acoustic music. With guitar, shekere, conga, and talking drum, the Nigerian Brothers make their traditional music as vital and insistent as any electronic pop. It's accessible and it should be heard. Combining palm wine music with folk songs and elements of highlife they aspire to overcome pain and suffering and lift everyone's spirits. I had to laugh when they went into "Moti Gboro," a song about a man who knows his wife is above temptation. The reason I was chuckling to myself is the opening riff reminded me of "El Manisero (The Peanut Vendor)", which I seem to hear everywhere. I must be electrically charged in some way that draws that riff out of the oddest places. The obvious hit from the album SONGS FROM THE VILLAGE is "Day by Day," with its titular nod to E.T. Mensah, a pioneer of Highlife. The harmonies are beautiful and the recording is superb, you can hear all the subtleties of the talking drum and the other percussion. "Maafe," a love song, and "Kajo," a call to dance, both show how much power can be derived from the simplest acoustic line-up. You could be sitting around a village, but you'd be very privileged indeed if your village included musicians of the calibre of Ken Okulolo and his Nigerian Brothers. Chief Stephen Osita Osadebe has been recording hits in Nigeria for over thirty years. Now he's taken the United States by storm with a stellar recording of his laid-back Nigerian Highlife, mixing western harmonies, Cuban-influenced muted trumpet, and the repeated guitar patterns that have evolved from Kru folk melodies. The lyrics don't shy away from politics but wisely couch their social critique in terms of mythology and fable. "Osondi Owendi," a massive hit from 1984 (which received Nigeria's only platinum album award so far), is reprised in a succinct eight minutes. This album's state-of-the-art recording will immediately open the ears of anyone not predisposed to enjoy this sound (or used to the thin sound of Chief Stephen's import albums on the Polygram label). This CD, recorded in a single session, is perfect party music. Turn it up and dance to the wild drumming and congas, or keep it low and let the horn phrases and lilting guitars lube the mood. Remember how exciting the first Highlife albums were? A new label called IndigeDisc has put out a compilation of scarce and classic Nigerian groovies from the '70s and '80s. Chief Stephen Osita Osadebe and his Nigerian Soundmakers last cropped up on the Green Linnet release, KEDU AMERICA in 1996. This new CD, SOUND TIME is compiled from his vast output (I have ten LPs by him and none of those tracks were selected; however I think he must have 100 albums out). The sound is familiar though: a long slow sweaty groove, quite often using the little G6 to D7 romp beloved by millions as the "Manicero" riff (throw C major in on the way to and fro for balance). The seven long cuts on the album were recorded from 1970 to 1985 (None tops 10 minutes, so if you want the 20 minute versions you'll have to look for the vinyl). Wah-wah guitar and jazz horns ride over the shakers, drums, and congas. The handsome package also includes the lyrics.